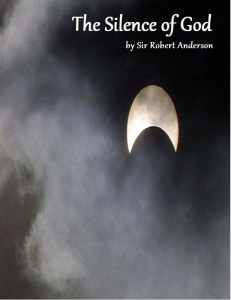 Many of us have been blessed by Sir Robert Anderson’s writings over the years. Some months ago I reviewed his Types In Hebrews which is also part of the “Sir Robert Anderson Library Series” by Kregel. I think The Silence Of God is a vital subject for today’s church. Anderson (1841-1918) explained that it was necessary for miracles to have ceased after the completion of the Canon because God’s revelation was completed in the New Testament, and also because belief in God must be by faith and not by sight. In addition, the next time God speaks it will be in judgment, not in grace, and no one should desire that to happen before all of God’s longsuffering for sinners has been completed. He writes, “And now a silent Heaven gives continuing proof that this great amnesty is still in force, and that the guiltiest of men may turn to God and find forgiveness of sins and eternal life. God is silent because He has spoken His last word of mercy and love, and judgment must await the ‘day of judgment’—there can be no place for it in this ‘day of grace.’” Anderson did not discount God’s general revelation in creation and providence, but rightly distinguished that from the special revelation of miracles and prophecy.